I’ve been using the Tecno Camon CX since it launched and my favourite feature on the phone, and indeed the phone’s selling point is the camera and especially the front one. I was never one to take a million selfies but maybe that’s because they never quite came out right. 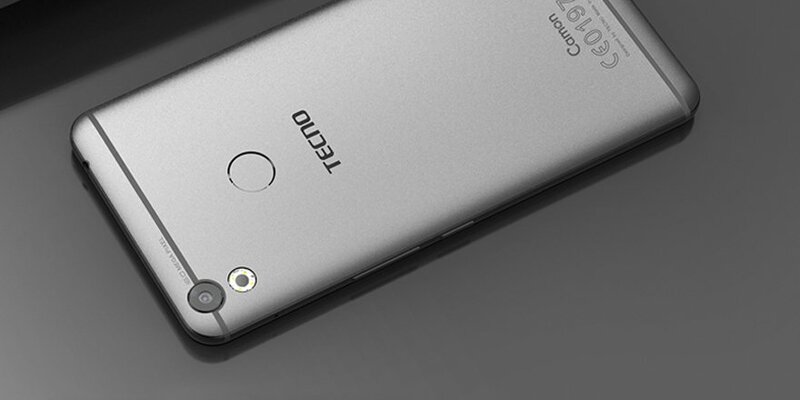 The Tecno Camon CX which runs on Tecno’s HiOs has made some deliberate efforts to up the selfie game with some key features specific to it. What makes the phone stand out in terms of selfies and photography as a whole? The Tecno Camon CX goes for Kshs.19,999/-. So, all the awesomeness we’re looking at in this article is all for a very affordable price. Let’s face it. The average camera phone user is an amateur photographer. This person may not know how to position the phone to take advantage of angles and lighting to take the best photos. This is made worse by the fact that in most phones, the camera is usually on the side of the phone and selfies often come out with the face looking lopsided. With the Camon CX like the C9 before it, the camera is right in the middle of the phone, so it takes photos at a very natural angle because you actually just look straight into the camera. Everyone wants to have the better version of themselves and we all know that this is not always the outcome of a selfie or photo. A little touch up here and there will usually enhance your features and towards this, the Camon CX comes with an inbuilt full make up kit that will take care of those blemishes and imperfections. One can do their foundation, eyeliner, eyebrows, eyelashes and even slap on some contact lenses. There’s even a feature to lift your boobies though I haven’t tried that yet. It comes with upto 8 make up styles and depending on the theme you want for your make up, the app will enable you to either look demure or look full party mode. The app uses face detection and the only problem I found with this is that it will only perfectly detects a perfectly set face. Tilt a little bit and smile and it loses a bit of bearing. For example, when I take a smiling selfie and try to put on some lipstick via the app, it loses the outline of the lips. This is not so for when I’m serious, in which case it captures the lips perfectly. Also, for those of us who wear glasses, I found that if I take a picture with glasses on, sometimes the app is unable to detect my pupils, which are the mother of the whole face detection thing in this case. These minor hitches are expected and understandable. Furthermore, there is an option for manually outlining your face and doing the make up. Manual adjust is actually quite thorough and if you have the time, it can give very accurate results. For a phone costing Kshs.19,999/- I feel the cameras are a real good deal. A lot of phones even about this price range come with a good back camera and paltry 5mp to 8mp front. Ask those who snapchat and they’ll tell you that this kind of camera does not do any good to your snap life. The Camon C9 comes with 16MP back and 16MP front with dual LED flash. The back camera has a quad LED flash. You know how you’re a group and the people at the ends get cut out of focus? Especially so if you’re holding the camera with your hands and you can only stretch so much. With a selfie stick its different but who always has a selfie stick at hand? With the Camon CX, the front camera wide angles and will take a panoramic selfie. Gone are the days when a selfie could only accommodate two or three people max. Sometimes night photos can look like there are ‘ghosts’ in the background. I could swear I’ve seen a hyena in one of mine – never mind that I took it in the house :-D. Anyway, sometimes there are too many shadows going on and the real focus of the photo does not really stand out. This is mostly due to poor lighting. The night photos taken with the Camon CX are noticeably clear with the ability to way brighter photos and reduce ‘noise’ in dark photos. We all know the feeling of freezing in smile/pose while the camera struggles to focus and click. Rush the camera and you get blurry photos. Camon CC has sorted this with a high speed focus camera that enables you to take decent photos even on the move. Say on a road trip or you can take photos of your child in the field during a game. Having said all that, the Camon CX is not just about selfies. It also packs other features that make it a mobile phone to reckon with. It comes with a free flip cover and this is what is particularly good about it. It features a semi circular cut out on the front side and when you flip it shut, it displays a beautiful Tecno clock. Swipe to the right and you get a shortcut to a flashlight. Swipe to the left and there’s a shortcut to music. I’m usually not a fan of cases but this one is a different case because it actually has some work other than just being a case. The phone has a very smooth finish unlike its predecessor Camon C9 which had a rough sandstone back cover. The phone has 2gb RAM and 16 GM internal memory expandable to 128GB by micro SD. With a 3200 mAh battery, up from 3000 mAh on the Camon C9. I’m able to use the phone for most of the day. I’m on phone throughout though and especially online and I find that I actually don’t need to have a power bank with me at all times. For Ksh.19,999/- this is certainly a worthy phone to buy. 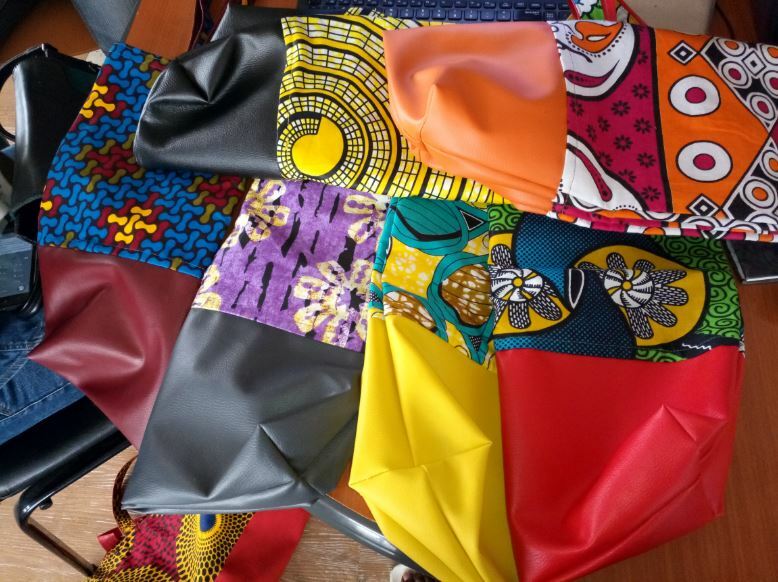 Some beautiful bags @kurlycheeks is making. Get her on twitter and order some. Day photo. 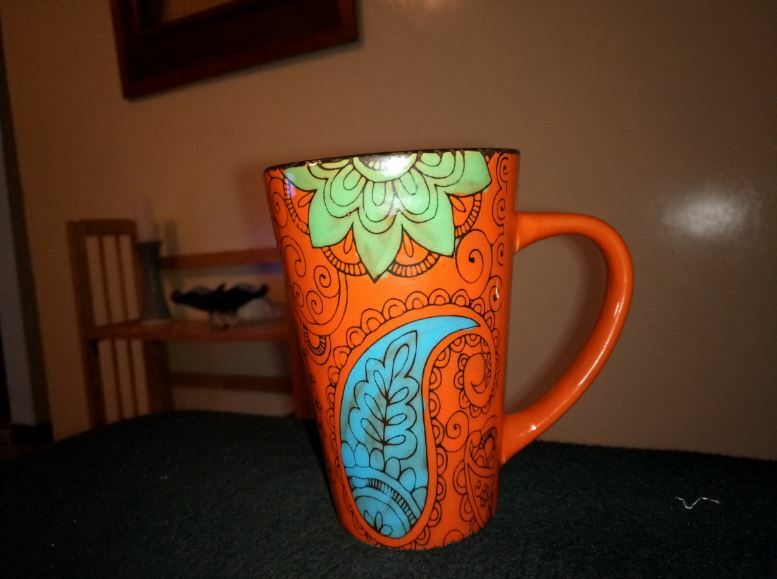 Night photo of a bright orange mug.